Mortgage Rates Still Rising. Is This The End Of The Refi Boom? Rock-bottom mortgage rates may be gone for good. This week’s Freddie Mac Primary Mortgage Market Survey shows in numbers what rate shoppers have learned the hard way — mortgage rates are spiking. During the 7-day period ending November 18, the average 30-year, conforming fixed rate mortgage jumped to 4.39 percent, an increase of 0.22% from the week prior. And it’s not just rates that are soaring. The average number of points charged to consumers increased to 0.9 percent last week. For most of the year, that cost had been 0.7 percent. One “point” is equal to 1 percent of your loan size. With the sudden rise in mortgage rates, we have to question whether the Refi Boom is ending. Between April and early-November, conforming mortgage rates dropped more than a full percentage point and, during that time, a lot of homeowners capitalized on the market. Refinance activity was strong; rates cut new lows each week. Today, however, Wall Street sentiment is different. There’s a growing concern for the future of the U.S. dollar, and that’s making mortgage bonds less attractive to investors. As demand drops, so does the underlying bond’s price which, in turn, causes mortgage rates to rise. Buy-sell patterns like this are common. The speed at which they’re changing is not. Mortgage lenders can barely keep up with the volatility, issuing up to 4 separate rate sheets in a day. Therefore, if you’re shopping for mortgage rates, or wondering whether it’s finally time to join the Refi Boom, the time to lock is now. 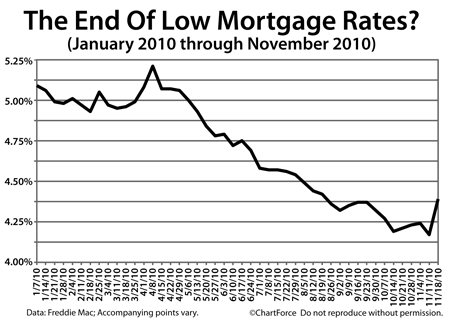 Mortgage rates should remain volatile through the New Year, at least. At what level they’ll be then, though, is anyone’s guess.